Opps I did it again...It is 4:34am and I was up doing research for my paper. I must say interesting research and not very difficult. One of my dissertations to turn in (in one month, I better get on the ball!) 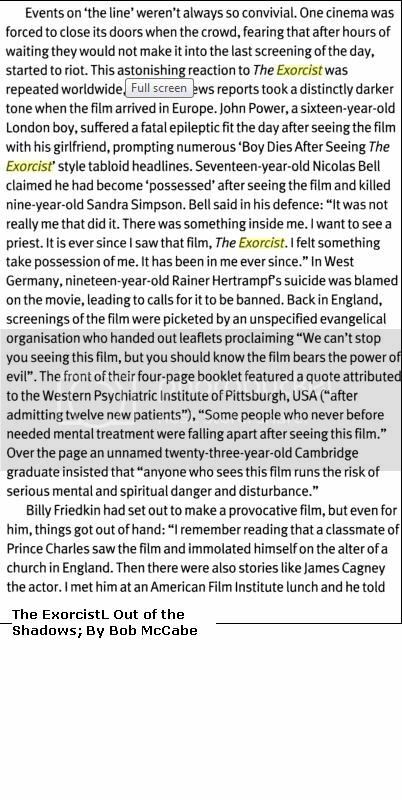 is on the intersemiotic translation of The Exorcist (by William Peter Blatty, novel, 1971)...aka how the book became a movie and what changed. The research is a ton of fun, not to mention watching the movie this late at night. I found out that most people when they saw this film were incredibly terrified. Some fainted in the movie theater, horribly grossed out, many puked. One man who was a barber left his job to join the preisthood. Europe had a particularly harsher reaction.